Hosting a Twitter chat lets you better engage with your followers and customers on Twitter and build community among them by using some of Twitter’s conversation-friendly features. Twitter chats are a great way to grow your social following, generate valuable discussions and feedback, and demonstrate thought leadership. Done right, they generate lively conversations and build deep connections between participants and brands. Like any social media tactic, before diving in it’s worth taking some time to understand the ins and outs of Twitter chats. The last thing you want is to host a Twitter chat with no chat—#tumbleweed #awkwardsilence anyone? Here’s a step-by-step guide to hosting a successful Twitter chat for business, including some best practices and examples of brand-led discussions to check out. The key to success? Like any dinner party, seminar, or other event that brings people together, you need to be the host with the most. A Twitter chat is a public discussion on Twitter around a specific hashtag (see: topic). Twitter chats are led by a designated moderator—brand or individual—who ask questions and facilitate the discussion at a predetermined time. On the web, Twitter chats are similar to forum Q&As (e.g. a Reddit Ask Me Anything (AMA) session), which involve people visiting a forum thread at a particular time to chat to the host. In offline terms, hosting a Twitter chat is like hosting an open house for neighbors to discuss a local issue or a Meetup group for people who share a common interest. In both cases, you set a date and time, choose a topic or theme, promote it to your audience, and then host a live, public discussion anyone can contribute to. On Twitter, hashtags rule supreme as the easiest way to find content. Twitter chats make good use of hashtags to drive people to them and build an audience. For example, search for #HootChat on Twitter to see how our regular Twitter chats work. We’ve rounded up a few more social marketing ones you can check out: 7 Twitter Chats Social Media Marketers Need to Follow. There are Twitter chats for almost any industry and topic you can think of. Search for more chats on Twitter or browse the Twitter chat lists at Tweet Reports and Twubs. When looking at Twitter chats, note that they include certain recurring elements (more on that later). First, what’s in it for you, and your participants? Hosting a chat shows followers that your business is open, accessible, and willing to engage with them—rather than just broadcasting content to them. By initiating and participating in open conversations with people interested in the topics you present for discussion, you create opportunities to connect with new people, including influencers, existing and potential customers, and others in your field. For others, it’s a chance to display some thought leadership of their own, raise their profile, and grow their audience by participating in a public debate. And other people might see Twitter chats as another source of interesting content they can add to their feed, as well as a way to find interesting people to follow and grow their network. That’s how Twitter can benefit your business. How can you run your own successful Twitter chat? First, let’s break out the most important things you need to know about. 6. Participants: The last thing you want is to end up talking to yourself, so getting the above things right is crucial, as is promoting your Twitter chat effectively. You can also invite selected participants and special guests. With these common elements in mind, here’s your step-by-step guide to hosting a Twitter chat for business. Resist the temptation to jump straight in. You’ll need to build a plan before starting your first Twitter chat. Follow these steps to give your chats the best chance of standing out and attracting engaged participants. Twitter chats take effort, so you need to make sure it’s the right tactic for you. How does a Twitter chat support your larger social media goals? Why choose the Twitter chat format over other publishing options? Does a chat support your community building goals? The Twitter chat format can be very powerful in creating a sense of “place” on an otherwise fragmented social media platform. On the flipside, it encourages opinion-based messaging, which can be a headache if topics turn controversial. What time and day did the chat take place? What response did questions generate? How engaging was the host? How relevant was the topic? How well was the chat promoted? What did you get out of the chat? Find existing chats relevant to your industry. This will have the added benefit of introducing you to participants you may want to invite to your own event. And, if you participate in other chat communities, people will be more likely to take part in yours. From sending out an email to telling a good joke, the secret to getting the best response is often timing. Twitter chats are no different. Will you host weekly chats? Monthly? Or will they be more sporadic, aligned with your marketing programs? Whatever you choose, be consistent. Your community will find value in knowing when to tune in, and will be able to integrate your chat into their own schedules. Also consider the timezone(s) of your community and when your followers are most active on Twitter. Our post, The Best Times to Post on Facebook, Twitter, and Instagram, provides a few pointers. While these times apply to regular Tweet publishing, they may be helpful as a jumping off point for scheduling your chat. You can also do your own research by following or participating in some popular chats on Twitter. Testing different times is a good idea. Where did you see the most engagement? How long was the chat? Where were the participants of your most successful chat from? You can even canvas opinion on Twitter among participants or possible participants, by asking what time would suit them best. A Twitter chat will almost always include a designated hashtag so participants can find the chat and follow along easily. Each time you tweet or respond to a tweet within the chat, you must ensure that you include that chat’s hashtag. The hashtag you choose will define your community. It should be simple, concise, and mean something when spoken aloud. Your hashtag can be branded (for example, SAP chose #SAPsmbchat for their small business chat and we use #Hootchat). Or it can be unbranded, so that those who don’t identify closely with your brand may feel more comfortable participating (for example, #smallbizchat). Keep your character count low. Every letter steals valuable space from your participants’ tweets. Stay away from abbreviations and acronyms that won’t make sense to a broader audience. Preparation is a crucial part of being a good Twitter chat host. It’s your job to not only start the conversation, but also keep it going and make it lively. First, you need to choose topics or themes for your chats so you can build a schedule in advance, send out invites, and promote your chats to your followers (see below). Most Twitter chats follow a Q&A format so you should also come up with five to 10 questions in advance, and try to predict answers so you have some responses prepared. There should be a fair amount of flexibility for Twitter chats to develop on their own, but it doesn’t hurt to be as prepared as possible. You can also create graphics or GIFs in advance to include in your chat posts, or even turn your questions into graphics to make them stand out in your followers’ feeds. To avoid an empty “room” when your Twitter chat day rolls around, you need to spend some time promoting your chat. Start by scheduling promotional tweets from relevant Twitter handles at different times of the day, as well as snippets of content from previous chats if it’s relevant. If you have nurtured relationships with your brand advocates, including employees and ambassadors, invite them to participate and help spread the word. Getting them involved prior to launch will build a feeling of exclusivity and deepen your relationship with your advocates. You should also use your other social media networks and email to promote your chat as appropriate. You can also set up a permanent Twitter chat landing page on your website with updated dates and topics before each Twitter chat, or a schedule if you have one worked out. Participating in other chats can also help when it comes to promoting your own chat. Keep a note of people you come across in these chats who would enjoy participating in your’s. Build a list of people to invite, and send each of them a tweet invitation prior to the chat starting (an hour or so beforehand seems to work well). Make your invitations unique and personalized. Craft them in a way that makes the recipient feel as though you’re exclusively inviting them. When Twitter chat day comes around, your first step will be to kick things off with a welcome tweet that introduces the chat and sets the tone. You can schedule this tweet in advance to make sure the chat begins at exactly the time your participants expect. You’ll also want to welcome participants to the chat, and to ask them to introduce themselves. This helps participants get more value from the chat by making connections with each other, as well as giving the experience a more personal feel and getting people involved early. This also gives you a chance to chat to each person individually to start building the deeper relationships you need to foster an ongoing Twitter chat community. Pay special attention to new participants so they are always made to feel welcome and involved. After the introductions comes the questions and answers—the reason you’ve brought your audience together to chat. To keep things moving during the Twitter chat, retweet the best answers and responses and ask follow-up questions when possible. Try to put the spotlight on your participants as the subject matter experts to create a livelier conversation. Close your chat by thanking your participants for joining, and by setting up your next chat. This also lets you promote next week’s (or next month’s) topic. Do Twitter chats seem like a lot of work? The good news is there are tools to make life easier, even if you are a time-strapped social media team of one. If you’re already using Hootsuite to manage and monitor your social network activity, you can save any chat as a stream in your Hootsuite dashboard. This will let you monitor the chat easily, as well as jump into it at any time without having to remember the right hashtag or conduct a manual search. You can also create a tab just for Twitter chats, and have multiple chat streams saved within this tab. Don’t have a Hootsuite account? Sign up today and connect your Twitter handle. Once you’re logged into Hootsuite you need to add a new tab within your Hootsuite dash, as you’re going to create a few chat-specific streams. You can use Hootsuite to search for the hashtag of a chat you want to join. You’ll see a number of Tweets show up in the results. At the bottom of the results, there’s a button to “Save as Stream.” This will allow you to save that search, and that chat hashtag, as a stream in your tab. You can now view the chat as it occurs in a saved stream. You can use Hootsuite tools to favorite and reply to Tweets from other participants, and use the compose dialogue box to create Tweets of your own. Just be sure to always include the hashtag for the chat. 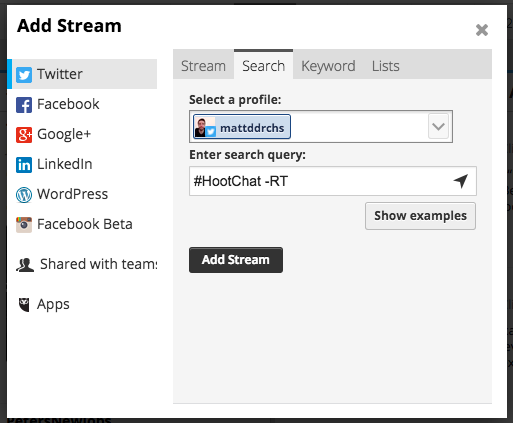 The Hootsuite stream will automatically check for and indicate that there are new Tweets available to view. Remember that each stream has its own refresh button so you don’t have to refresh your entire screen. Once you’ve got a new tab started, you’re going to want to populate it with information streams. The first stream inside your new “Chat” tab is going to be the main chat stream. This stream will aggregate the entire conversation in one place. You’ll want to keep this stream fairly open, but it’s useful to remove retweets from it to cut down on the conversation volume a little. For this main stream, you’ll create a search stream for the chat hashtag (in this case #Hootchat) and the syntax “-RT” to remove both old-style and new-style retweets from the conversation. To make managing the Q&A conversation format smoother, you’ll want to filter for these questions and answers in the chat stream. Add separate search streams with the following syntaxes to your Chat tab. Depending on the needs and structure of the Twitter chat, it’s often a good idea to create streams with custom syntaxes. For example, Hootsuite’s #HootJobs chat doesn’t follow the Q1/A1 format of most chats, choosing instead a Q&A free-for-all with questions and answers sourced from the community. During this chat we used a search stream with the syntax “#HootJobs AND ?” to filter the conversation for questions only. Test new search streams to find what works best for you. After the conversation has ended, it’s time to reflect, measure, and learn. First, decide what you want to track. Metrics like hashtag mentions, hashtag impressions, and participants can inform how well your chat resonated with the audience. Look for increased engagement or a spike in new followers—an indicator of community growth. Social measurement and analytics tools, such as Hootsuite Insights, can help dive into the chat results and quantify your efforts. Choose metrics that you can report on consistently over the long term to identify trends in community growth or to adjust your activities to better serve your audience. The story of your Twitter chat doesn’t end with the numbers. You can curate the best responses and conversation for later by taking screenshots. Highlight prominent community members, influencers or customers, and mine the responses for “quotable” nuggets. These insights will help you tweak the delivery of your next chat. If the conversation was particularly interesting or memorable, consider bringing some of the best content together into a blog post. Hosting a Twitter chat requires constant tweaking, learning, and reformatting to suit the ever-changing needs of your audience. By following the steps and tips above, you’ll be on your way to creating a Twitter chat that’s sure to engage your online audience. Whether you’re planning to run a Twitter chat or just participate in one, Hootsuite can help. Try it free today. With files from Matt Diederichs.